Blackfriars, the UK and Commonwealth publisher of Hild, is a brand new literary imprint of Little, Brown. 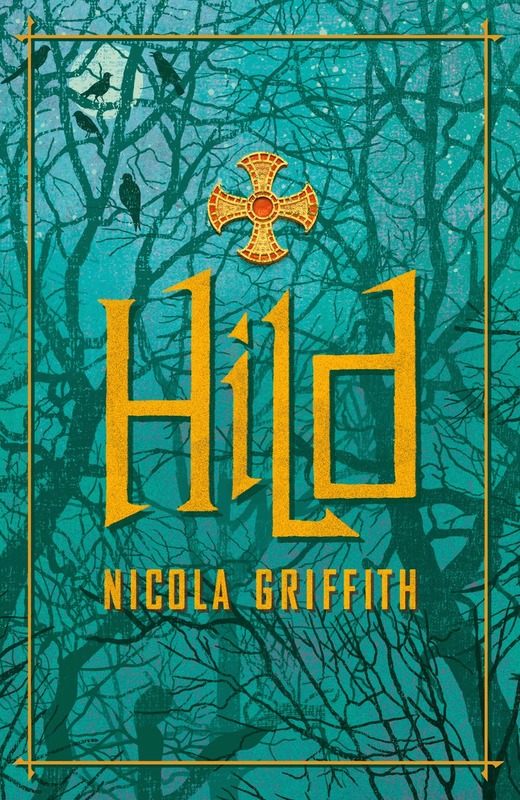 Hild will be their first ever hardback. After some thought, they decided that for their audience the cover would look more attractive without representation of Hild herself. I agree. What do you think? This version will be on sale in the UK on April 10 (digital) and July 24 (hardback and paperback). The audio edition is already available. Also, in case you missed it, I did a TV interview on PBS (a bit like BBC 1). And coming soon is a radio interview on NPR (the equivalent of, hmmm, Radio 4)*. 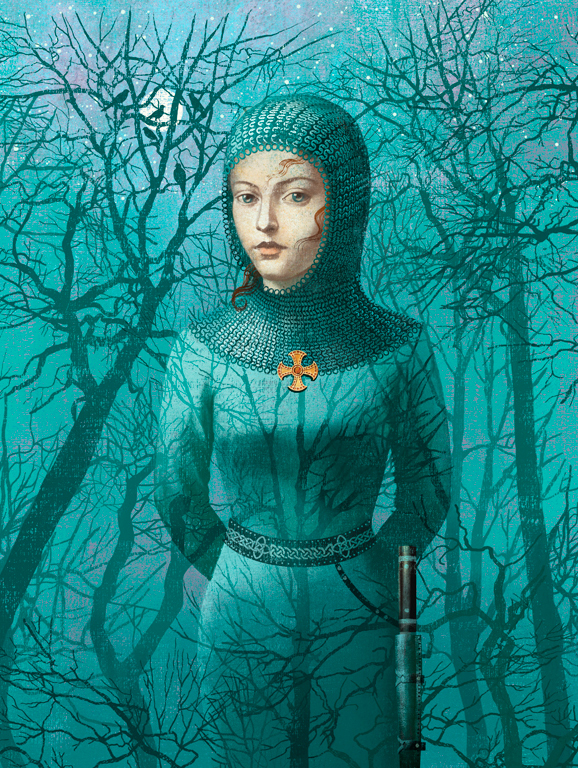 That’s not due out til April 6 so to whet your appetite, here’s the NPR review of Hild. I agree, I prefer the cover without the little girl, the trees and colour are evocative enough. Much better without the saccharine girl-image, which I initially felt limited, and then felt contradicted the image of Hild as a real, complex character. By the way, the thing I (as a historical textiles re-enacter) found least believeable about the book was the idea that tablet weaving could easily be done by two people, without turning it into a game of cat's cradle. Maybe if you stabilized the center, and worked outwards with two sets of cards, but one turner and beater? No. Working on a full-sized warp-weighted loom, however, definitely works best with two to throw a shuttle through the sheds, and then beat. Barbara, it sounds as though my interpretation of tablet weave isn't the same as yours–which means, I'm guessing, that I'm wrong! Let's chat by email. The UK cover looks as if we are seeing the landscape through Hild's eyes. A great decision. Much better than the US cover, which makes it look like a YA novel, which it is not, and could turn away some of your best potential readers. I, too, prefer the UK cover. And I hear you about the YA confusion. Ahem — a voice of dissent here. I love the US cover! I blogged about it here and here before even reading the book. However, no one representation will be right for everyone. I just wish it could have been redone completely rather than hacking out the heart of a work of art. Looked at on its own, the painting the Balbussos did is absolutely gorgeous. Truly lovely. But the reduced perspective of the FSG cover…well, reduces it. And changes the apparent proportions of Hild herself making it look much more YA-ish than I'd like. Having saId that, the FSG cover is still a beautiful thing. I am not complaining! For the UK market, the Blackfriars cover is better. Whatever dress it wears, I hope the book sells madly in the UK! And go into many future editions allowing for further experiments with cover art. Maybe the Balbussos' painting could be used in its entirety.